Michael Kumpf, from Indianapolis, gives daughter Mazie a close-up view of ‘Laura Giganotosaurus’, one of the prehistoric characters in the Great Smoky Mountains Railroad’s special ‘Jim Henson’s Dinosaur Train™’ excursion. After departing Bryson City, the train stops in Whittier at the ‘Nature Trackers Adventure Area’ where the fields and woods are inhabited with the lovable monsters from the popular PBS Kids Television series. Budding archaeologists can identify dinosaur tracks, assist in a dinosaur dig and play miniature golf with dinosaur ‘eggs’. 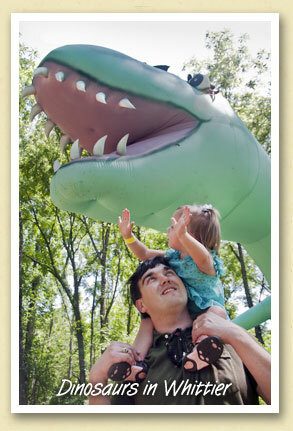 This year’s Dinosaur Train excursions conclude next weekend with departures on Friday and Saturday. August 4 & 5. For more information, visit GSMR.com.